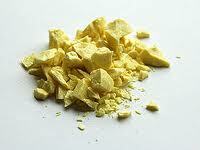 Why Sulphur & Not Sulfur? Hot Sulphur Springs was originally a summer campground for Indians who came for the hot springs. When Grand County was formed, it was the first county seat from 1874 to 1882, after which it moved to Grand Lake. The county seat returned in 1888 and has been here ever since. This town was established in 1860 making it the oldest town in the county and originally named Saratoga West and sometimes called Warm Springs. In 1863 the name was changed to reflect the hot springs in the area that were used for medicinal purposes. The town site was bought by William Newton Byers, founder of the Rocky Mountain News, in 1864. He wished to make it a spa and resort so surveyed, platted and named the streets to the city. It was incorporated April 1, 1903. William Byers original family cabin is located at 204 Byers Avenue, along what is now Highway 40 and still exists to this day. The building is currently the county's only mortuary. The first winter carnival in Hot Sulphur Springs was held on Dec. 31st, 1911. The success of this event led to a 3-day carnival which took place on Feb. 10-12, 1912. The following winter; a second annual winter carnival was planned in Hot Sulphur Springs, and it was planned in conjunction with the first Steamboat Springs Winter Sports Carnival. This series of events led to the creation of Howelson Hill in Steamboat Springs, and is credited with playing a large role in the birth of the Colorado ski industry. Click here for a link to the Denver Public Library, Western History, Hot Sulphur Springs page of photos in their Digital Collection. There are over 300 Hot Sulphur Springs documents on this site with full descriptions and dates. All are medium-sized and can be downloaded and printed. 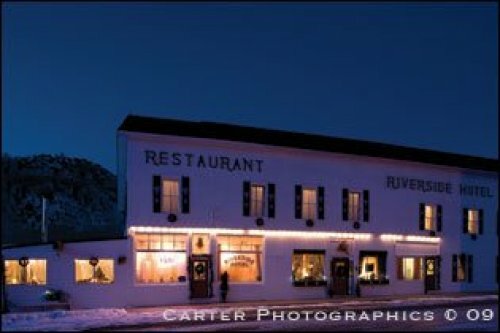 The panoramic photograph above is of downtown Hot Sulphur Springs, Colorado that was taken on October 18, 2012 on Grand Avenue looking west towards the Colorado River. The empty lot on the left side of the street is where the Bank Block once stood before it was consumed by fire in November of 1977. Next to that is a brown clapboard building that was once a grocery store that is now a private residence. To the right of that building with the American flag in front is the Hot Sulphur Springs Post Office. On the right hand side of the street is the old Riverside Garage where many town notables including Olympic skier Barney McLean's father George Washington McLean ran a garage. This building now houses private residence lofts. Note the 'ghost' G-A-R-A-G-E letters at the top of the building. 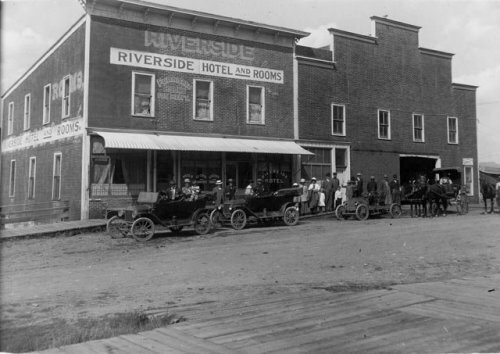 The white clapboard building next to the garage is the old Riverside Hotel that provided rooms, food and other services since 1903. In 2011 the building became a private residence. An earlier photograph of this building can be seen in the top black and white photograph on the left and by clicking here.